Gazprom and BASF have agreed to complete the swap of assets with equivalent value signed in December 2013. Gazprom is the largest Russian energy company. Gazprom’s major business lines are geological exploration, production, transportation and sale of gas within the Russian Federation and abroad. The company is also engaged in oil production, refining activities and electricity generation. The company was created in 1989 and privatized in 1993, even though in 2005 the Russian Government regained control over the company. In the same year the government removed the 20% restriction on foreign investment and the company became fully open to foreign investors. BASF SE is a Germany-based chemical company, which comprises subsidiaries and joint ventures in over 80 countries throughout the world. Its operations range from chemicals, plastics, performance and crop protection products to oil and gas production and distribution. In particular, BASF operates in the latter business through its wholly-owned subsidiary Wintershall Holding AG. In central and Eastern Europe Wintershall collaborates with Gazprom through three joint ventures called WINGAS, WIEH and WIEE. WINGAS and WIEH supply hydrocarbons and natural gas in Germany, Austria, UK, Belgium and the Netherlands, while WIEE is focused on natural gas sales in Southeastern Europe. Through this Asset Swap deal Wintershall will receive a 25% share in the development of the blocks IV and V in the Achimov formation of the Urengoy natural gas and condensate field in western Siberia. The field has total resources of around 274 billion cubic meters of gas and production is expected to start in 2018. In return, Wintershall will transfer its 50% participation in the joint ventures WINGAS, WIEH and WIEE to Gazprom. The deal also gives Gazprom a 50% share in Wintershall’s Nordzee BV business, which produces oil and gas in the southern North Sea. Together these activities contributed about €12.2 billion to sales of the BASF Group in 2014. The completion of the asset swap is expected by the end of 2015 and will be financially retroactive to April 1, 2013. In December 2013, Gazprom and Wintershall signed a Master Agreement to swap assets. The deal was intended to be completed by the end of 2014. In December 2014, the two companies announced the suspension of the deal because of a “difficult political environment”. After Russia’s occupation of Crimea, western countries imposed sanctions and restrictions on conducting business with state-backed companies like Gazprom. Gazprom had to face limited access to western technologies and had to suspend its plan to develop Russian shale oil fields. Even though these sanctions did not explicitly bar the BASF-Gazprom deal, the Russian company decided to suspend almost all its expansion projects in Western Europe. However, in September 2015, the two companies finally agreed to complete the swap, which has already received the approval of the European Commission. The completion of the deal can be seen as a symbol of new improved business sentiment towards Russia after the political clashes of the last two years. The strategic interaction following the asset swap between Gazprom and BASF will enable the two companies to cooperate in matters such as petro chemistry, energy efficiency, ecology, sci-tech as well as staff training and career development. In the framework of petrochemical cooperation between the two conglomerates, the most discussed issues are the transmission and processing of oil and gas production. Both companies pointed out the urgency of using chemical products and technologies during 14 meetings last year: they agreed it would improve further drilling and cementing. 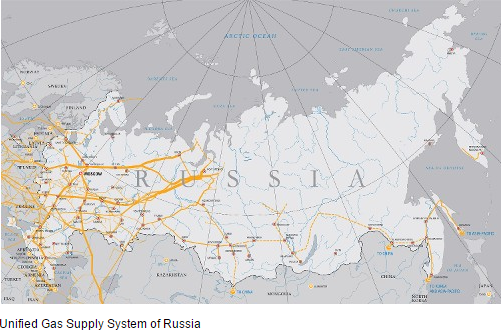 All of Russia’s natural gas production is delivered into gas trunk lines integrated in the Unified Gas Supply System (UGSS) of Russia, which is owned by Gazprom. The UGSS is considered to be the world’s largest gas transmission system and it insures continuous gas supply from the wellhead to the final consumer. It represents a unique engineering complex encompassing gas production, processing, distribution facilities, transmission and storage. The prospective strategic sci-tech cooperation is expected to enforce international quality specifications for supplied gas, to improve competence in managing large-scale investment projects, as well as to improve safety and collective research of new technologies for the active development of gas. As a result of the deal, Gazprom will strengthen its distribution business in Europe in the face of regulatory pressure while Wintershall AG will have the opportunity to expand the natural-gas production by accessing gas fields in Siberia. Generally speaking, an asset swap deal represents the exchange of one asset for another. We can see an asset swap as an alternative way to structure a deal between two companies, where instead of using shares and cash to complete the acquisition, the two entities agree to swap business units, cash-generating assets or participations in subsidiaries or in other entities. As any other method of structuring a deal, the asset swap has its own strengths and weaknesses, too. One of the main benefits of an asset swap deal is that it enables a better balance in the business portfolio of a company. In fact, it allows corporations to expand their core business or to enter a new market and at the same time to divest from non-core activities. Another important advantage of this method is that it could represent a good alternative for corporations that have little or no access to cash or credit but still want to expand their business and refocus their portfolios. Another advantage of asset swaps is that, if the swap is classified under “Like-Kind Exchange” (for the US tax law), it could limit the tax liability from the sale of the business unit. However, asset swaps present a considerable amount of disadvantages that make this kind of deal very rare in the market. The biggest issue is to find the counterparty that has complementary needs and sequentially find matching assets to complete the trade. The second biggest issue is that assets swaps involve two sets of valuations and due diligences, potentially increasing valuation elements on which the two corporations disagree.